Massachusetts State Route 286 is a short east-west highway in Northeastern Massachusetts. It runs from the Massachusetts/New Hampshire State Line to Interstate 95. This highway is under two and a half miles in length. 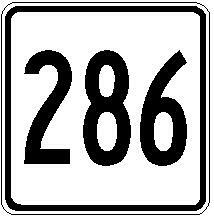 MA St Rt 286 does not pass through any towns in Essex County. MA St Rt 286 is not multi-plexed in Essex County. MA St Rt 286 intersects the following highways in Essex County. U.S. Rt. 1, near Salisbury.